I’ve just received my first order of a bonus pack – very excited to try the cafe blend first. The smell (even before opening the postal pack!) was awesome – the taste was different from the other Byron grower, which has just closed it’s door recently – I blitzed it with some organic butter and some XCT coconut oil and it was AMAZING! I will try the espresso (dark roast) tomorrow – straight. I cannot speak too highly of Robert’s coffee. I was introduced to it by Graeme last year, and I was hooked. There are many coffee aficionados in the ST world (don’t forget the Coffee Shop conversations, started by Dave; these were explicitly fuelled by coffee! ), and I can only recommend the Ewingsdale beans. Liv and I drink the same roast that we first drank at Graeme’s: the “Dark Roast”. We get in 4Kg lots (this minimises the postage from Byron Bay to Greenwell Point). We use a decent conical burr grinder, and pair of AeroPresses. This is the best coffee I have ever had. Thanks a million for the coffee you sent last week. The mild (gold) Byron blend is exactly what I was after! And the other two are simply divine as well. All other coffee pales in comparison to your blends. Truly magnificent stuff! We appreciate your efforts very much. Wow that was fast! I ordered the Dark Roast, Espresso Grind yesterday. The parcel turned up this morning and I’m enjoying the first cup as I write this. Thanks Robert. I love the taste of the medium roast,Byron Blend. It’s rich and creamy with a beautiful caramel flavour and a rich chocolaty aroma. The satisfaction starts when I unzip the bag and inhale the contents, and continues right through to the last sip from a large plunger pot made just for me. What a treat! Having first purchased Ewingsdale coffee at the local market while on holidays, we now order the coffee without grief, fuss or delay. With Ewingsdale coffee, you ditch the sugar, enjoy the coffee, and buy Australian. Hi Robert, Received our coffee today in our Po Box, safe & sound! Many thanks, your a star. Thanks Robert, I’ve emailed you, just to say we are really enjoying your Dark Roast beans. It is amazing what you are doing. It’s important to us that we can buy locally grown (reasonably) products. We recommend your product to everyone we know. My sweet husband cant drink anything else .. I have placed another order of the Estate Blend Plunger Grind…Yay- we look forward to drinking it again! I bought some of your Coffee today at the Byron markets, so we could sample your coffee for my Mobile Cafe business… I must say, that I have tried quite a few coffees and yours was just amazing! Got through the last of my previous organic and filled the grinder with your Estate blend. I chose that one to try first as I guessed, seeing you promote that one with the bonus pack, that it was possibly your favourite:-). Sensational. Absolutely beautiful, mouth-watering flavour. I am looking forward to tasting the next two! :-). Congratulations on an amazingly good coffee. It would be great if more online businesses could take a leaf (or a bean) out of your book. I like that I’ll be getting freshly roasted coffee too. 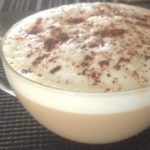 I can’t wait for my next order, as I’ve been searching for a perfect organic coffee for a long time and it’s great that it’s grown here. I used to live over that way and loved your coffee.Hard to find decent coffee over this way and I love the fact,your coffee is grown in Australia. Looking forward to the arrival of that beautiful smelling parcel. We have been trying a variety of Australian grown coffee beans and your Ewingsdale Coffee and customer service stands far above the rest. Thank you!Both the Cafe and Estate blends of roasts we really enjoyed- Estate was very nutty and smooth and cafe has a bit fruitier and chocolatey nose. Great balance in both. Incredible crema. We are organic farmers in Margaret River, WA and love to support Australian grown produce. Our first Ewingdale coffee was while on holidays in Byron Bay. We enjoyed it on the verandah at the Ewingsdale Estate. With the sun shining over the lush trees, clean air and a gentle sea breeze, we could “taste the love” that has gone into producing this rich smooth coffee. We were hooked and as soon as we got back home we put in an order and also started using the 100 grm coffee packs in our bungalow breakfast baskets. We like to grind the freshly roasted beans ourselves and use a stove top espresso maker. Keep up the great work Ewingsdale! We have been using Ewingsdale coffee for 5 years since our local butcher recommended it. Given my surname is Ewing I had to try it! 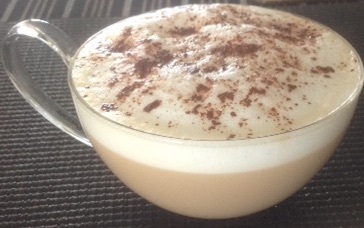 Now we find it hard to drink anything other than Ewingsdale coffee from our own home machine! Only coffee in Italy can compare with this Australian grown coffee. The crema is thick and there is no bitter aftertaste. I live in Mullumbimby NSW and the first time I tried Ewingsdale Coffee was when I was sourcing coffee for Mullum Mac. I wanted to buy an Australian grown coffee. Now I refuse to use anything else in the store. Ewingsdale Coffee has a great easy drinking flavour and a rich dark golden crema. Grown locally and organically at Byron Bay in rich volcanic soils. You can taste the love, which is why Ewingsdale Coffee is the beans I choose. I live on the far South Coast of NSW in a lovely little village called Cobargo. I first tried Ewingsdale coffee after I bought some for my brother while visiting Byron Bay. I love the smooth rich flavour. It produces a great crema. It’s special because it has been hand-picked,sun-dried, master roasted and it’s a 100% Australian Grown coffee. I wouldn’t buy anything else! Hi Rob, I really enjoy your fabulous coffee. It certainly lives up to the hype – “no bitter after taste”. You can ‘Taste the Love’ in your fantastic organically grown coffee. I’m from Avalon, NSW and I first tried Ewingsdale coffee a few years ago when I bought some whole beans when visiting the local markets in Byron Bay. I’ve tasted most of the coffees available but found Ewingsdale’s rich mellow flavour the best, so now it’s the only one I buy. I also like the fact that it’s an organic, local and an Australian grown product. 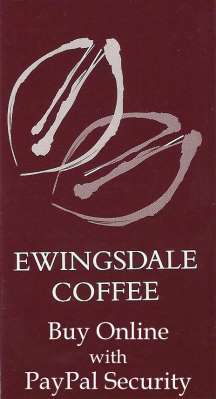 We first tried Ewingsdale coffee in early 2003 when we visited Ewingsdale Coffee Estate. We were hooked! And it has been our coffee of choice ever since. No more bitter after taste or ‘dry mouth’ so prevalent with other coffee brands and which had us heading for the nearest glass of water. Being very pro-organic and ‘buy an Australian grown product first’, we were thrilled to learn how the coffee is grown and harvested, and roasted locally. We continue to recommend Ewingsdale Coffee to family, friends and business acquaintances, and buy it for gifts. Well done! Our best wishes for future success. I first tried Ewingsdale Coffee when Robert gave me a sample bag to try a couple of years ago – that was before he decided to become a coffee plantation owner. I only drink it when I’m at home or with other members of the family who also buy/drink Ewingsdale coffee. I love it because when it’s delivered, you can smell that fresh aroma that only recently roasted beans can give. The coffee tastes great. I bought some Ewingsdale Coffee beans from Chris at the Bellingen markets and I love them! So rich and smooth and fresh. SO MUCH LOVE! My parents brought back a pack of Ewingsdale whole coffee beans as a gift from their NSW trip. Even though we live in a VERY well-known Australian coffee growing region in Far Nth Qld, we’re often disappointed with the “award winning” boutique coffee sold here – they lack taste, can be bitter and lose their flavour quickly…but we weren’t disappointed when we tried the Ewingsdale beans, even to the last one! I reckon you can taste the love in every bean and the care in each step of the manufacturing process and certainly the freshness with no bitterness at all. We’ve been using Ewingsdale Coffee at our Cafe for over a year now. The coffee is consistently of a high standard with that freshly roasted aroma, rich crema and a smooth finish. Owning our own machine is an advantage, because you can try a variety of brands. Not only is Ewingsdale Coffee a fantastic coffee, it is grown organically, here in Byron Bay. Having visited the plantation and seen each step of the production (from hand picking – to the sun drying of the beans), it is obvious that great care is taken – the end result is – “the finest hand crafted coffee in Byron”. So when visiting Byron Bay, drop into Soul Bowl – we’re opposite the main beach surf club – for your heathy, fresh food on the beach. Eat in or takeaway, and always happy to make you a Ewingsdale Coffee. I can ‘Taste the Love’ of your coffee, and the fact that it’s a 100% Australian grown coffee makes it even better. I am so glad a friend put us onto it. Can we buy in bulk? Do you have 3kg bean bags? I will split it and share the love with a friend.